Déménagement en provenance/direction de Omaha NE 68131? Obtenez GRATUITEMENT des estimations de tarif pour la location de camion au Mid City Storage. Les camions de location U-Haul sont spécifiquement conçus pour déménager des familles et non pour transporter des marchandises. Nos camions de déménagement possèdent plus de particularités de sécurité que tous les autres camions de déménagement de l'industrie, incluant une suspension pour un roulement en douceur et des rétroviseurs offrant une grande visibilité afin d'aider le conducteur. Que vous déménagiez d'un petit appartement ou d'une grande maison, le service de location de camions U-Haul à Omaha, NE vous offrira la location de camion de déménagement dont vous avez besoin pour vous rendre du point A au point B. Trouvez le camion de déménagement de la taille parfaite pour vous aider à déménager chez U-Haul, qui offre la location de camion à 19,95 $! Les fourgonnettes et camionnettes de location U-Haul de Omaha, NE sont idéales pour les projets d'amélioration domiciliaire, les livraisons et d'autres petits chargements. Louez une fourgonnette ou une camionnette pour économiser lors d'un déménagement ou de livraisons de courte distance. La location de fourgonnettes et de camionnettes est très populaire auprès des entreprises locales et des étudiants, comme pour les petits déménagements résidentiels à Omaha NE 68131. Nos fourgonnettes de déménagement en location sont équipées de la climatisation, de barres de protection pour protéger vos biens et d'une attache pour remorque de location. U-Haul offre des fourgonnettes de location à 19,95 $ à Omaha, NE; réservez une fourgonnette pour votre déménagement chez Mid City Storage! I spoke with Samantha from a different location and she found us a U-Haul under extreme time constraints. Samantha wherever you are, you saved our already stressful moving weekend. Thank you so much for your calm demeanor and helping us get to Des Moines seamlessly. I have used this location for years and always come back. Keep up the great service! A slight miscommunication on what was going on with my card and billing. The return process wasn’t made clear as I thought all I had to do was drop off keys. I thought I prepaid but actually they just put my card on hold. Had to go through an unknown online process and haven’t been charged for what I owe $97. When I was told to pay I was confused and thought I was being double charged. So I refused the charges. I would like to pay my balance sooner than later. Outside of this confusion everything was terrific and made my move a lot easier. The staff was very pleasant. However, I would not recommend this location to a friend because our final calculated mileage was 22 miles over what we drove. I am not planning to argue the bill because we do not have photo proof of the mileage before we started our trip. Lesson learned for next time. I reserved a 17’ trailer earlier in the week. Upon arrival, they said it wasn’t available so my options were 15’ or 20’. It ended up working out with the 15’, although 17’ would have been ideal. I expect to get what I asked for especially reserving it days in advance. Not much, very friendly and helpful staff. Carl’s customer service far exceeded my expectations. He made the process quick, and was extremely thorough, and was clear with instruction. I would recommend this location to others! Aside from new wiper blades, everything, service included, was outstanding. Thanks for coming through in a pinch. Quick and efficient check out system. Very responsive to late minute changes. Door to trailer was frozen, tough to open. Tough backing in to get hitched up; ice in front of trailer. Don't change a thing. Smooth process. Helpful person. The young man who helped us was very friendly and professional! This was a great experience. The young man who helped us was friendly, quick, and knowledgeable. The trucks were clean and well maintained. Renting took only about 10 minutes! I will go back here anytime I need moving help! The owner of this location is fantastic! He immediately makes you feel welcome and takes time to make sure you are comfortable with the truck before you leave. I would highly recommend for all rental needs! It would have been nice to have been informed about the checkin process. I had to get in and out of the vehicle several times to complete the return process. Each time when I got out I locked the vehicle and returned to the key drop area only to find out that I needed to sit the parking brake, get pictures of fuel, mileage, and cleanliness, I liked the app and turning my truck in that way, but it was just very frustrating to go back and forth through the process late at night and very tired. Friendly and helpful staff. We used the cargo van as our "tent" for the week-end....and boy were we grateful. We blew up a double aero mattress and stayed dry even through some terrific storms. I think you should advertise the advantage of a "tent" cargo van. Price is great, except for the extra high cost per mile. Rental car mileage is free. I was to bring the truck back at 5/8 tank full. Impossible to hit this right on, and we all know that. I even questioned that when I picked it up and the man giggled and said "ya". So, I knew unless I was over substantially I was getting nailed. Great warm customer service feeling. Just have the trucks full and return full, much better customer experience, no guessing for anyone, clean and simple. Everyone was Super friendly! 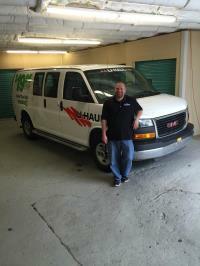 I always use uhaul for my moves because of the price and the great customer service. The owner gave wrong information. I asked if I can return the trailer early and he said yes even if the place is closed. He said to just leave the trailer there and the drop off place will get it the next day and that's it.